Enjoying an afternoon at the beach or pool is a beloved Australian past time and being safe in and around the water is paramount. To help raise awareness of this important issue, YMCA SA delivers dedicated water safety weeks as part of our Swimming Lessons program. Learn in the pool, swim in the world! 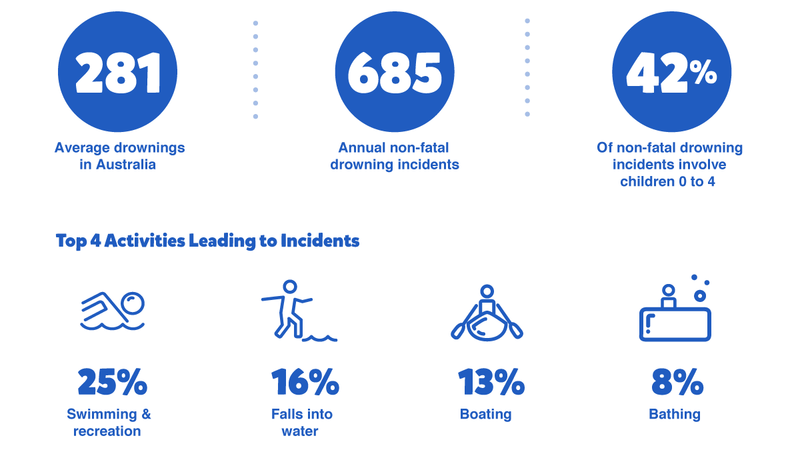 Drowning continues to be the leading external cause of death in children under five years of age in Australia, with 29 deaths and countless more non-fatal incidents reported in 2017. Children can drown in seconds in as little as 5cm of water. It can happen any place with a body of water, including pools, baths, spas, dams, rivers, creeks, garden ponds and buckets. Ensure the pool has a compliant pool barrier that is used correctly and maintained regularly. Ensure an active supervisor is always present; a responsible adult who is close (within arms-reach) and focused. Learn CPR. Remember that any attempt is better than none at all. Teach children water familiarisation and swimming skills. The Royal Life Saving Society – Australia believes that children will be safer in the water by learning water safety, survival and swimming skills at an early age. Brenner et al (2009)* found a protective association between formal swimming lessons and the risk of drowning in children aged 1-4 years – an 88% interpreted reduction in the risk of drowning. Learn in the pool. Swim in the world! Knowing the link between water safety and learning to swim at a young age, the YMCA encourages children to learn valuable life skills through our dedicated Safety Weeks. Occurring four times a year in March, June, August and November, our Safety Weeks make learning fun with themed activities that teach children to be safe and vigilant in the pool, at the beach and beyond. Data obtained from the Royal Life Saving National Drowning Report 2017, accessed here. Brenner, R.A., et al., 'Association Between Swimming Lessons and Drowning in Childhood. A Case-Control Study'. Archives of Pediatrics & Adolescent Medicine, 2009. 163(3): p. 203.210.